The effective delivery of care is incredibly complicated. Of course every industry has its own challenges and complications but healthcare is by far the most complicated because in order for Healthcare to win it has to excel at two levels simultaneously, and both are critical and complex. First, Healthcare must win at patient care using ever changing medical technology and clinical protocols (the science of medicine) and they have to synchronize, execute and deliver those clinical protocols operationally with skills and capabilities that are efficient, safe and effective (the delivery of care). The approach used by Group50 Healthcare is designed to span the gap between clinical protocols (the science of medicine) and operational protocols (the delivery of care).Without the ability to synchronize and deliver clinical protocols effectively healthcare cannot win the game, period. Senior healthcare leaders are puzzled and many have said “we’re losing the delivery of care contest but we have the best doctors, nurses and technology”. It doesn’t matter if you have the best players, the team that wins is the one that executes the playbook the best all the time. You can’t be the best clinically and just okay operationally. You can’t do only one well and win, you have to do both. Leaders in healthcare don’t always recognize what winning looks or feels like. Unfortunately in healthcare, the most common definition of winning is just surviving the day or playing not to lose. Or worse, “making the budget” (just another way to say tie game). But in healthcare there are no tie games and a tie is as good as a loss. What is winning in healthcare? Patient care is both clinically and operationally in control. Performance improvement centers around patient care at the bedside. This above list is what consultants from Group50 Healthcare are most skilled at. We work closely with our clients to create healthcare environments that leverage people, process and technology and we use the above list as our litmus test. 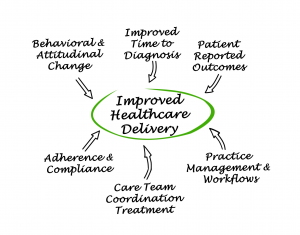 We are not experts in the science of medicine but we are experts in the delivery of care..
Our healthcare performance improvement tools have been finely tuned by the delivery of over 100 projects. You can see what our clients have realized in the healthcare section of Group50’s project overviews. Talk to a Group50 healthcare professional about how to significantly lower the cost of healthcare operations by calling (909) 949-9083, sending an email to info@group50.com or requesting more information here.